Solar Cooling – The Worlds Most Energy Efficient Air Conditioning System. This Thermx Solar Cooling patented technology can reduce energy consumption by up to 60% on most types of commercial HVAC systems right across the board from the smallest split system right through to the largest VRF systems and large Air Cooled Water Chillers. Don’t just take our word for it. Pizza Hut, Johnson Matthey, Cummins, Texaco, Spar, the MOD and Mercedes Benz (to name just a few) have all got the Thermx solar cooling systems installed. Put simply these unique patented solar collectors contain refrigerant, and the collectors then connect into the refrigerant circuits of the A/C and Refrigeration systems enabling the solar panels to take away the bulk of the load and therefore hold off the compressors until absolutely necessary. Today’s latest compressor technology are variable speed, therefore the refrigeration system is working with a considerably improved correlation between demand and production. The compressor has the ability to slow down in variable or staged modes, and because the solar cooling system implements the Solar Collector heat source allowing the compressor to take advantage of that heat, therefore achieving the desired cooling capacity without the additional energy consumption. The compressor technology is enhanced with a unique proprietary developed solar thermal collection system. Therefore this means that this works as a super advanced compressor system. ThermX™ uses an exclusive patented process, of placing a 3-party heat exchanger between the Compressor and Condenser. Utilising the free available energy from the sun to heat the refrigerant & subsequently reducing the workload of the compressor/s.. The hotter the sun shines, the more the solar system takes over the heating of the refrigerant gas and the more power is saved. The compressor acts now mainly as a pump, providing the necessary cycle flow. In heating mode the system works in almost the same way, but now the flow changes compared to the cooling mode. The additional free heating of the refrigerant in the solar panel allows the compressor to reduce its load, and therefore, its power consumption. Dependent on sun levels, COP figures of over 8 are possible! The system is also fitted with a special Solar Bypass Valve. This allows the refrigerant gas to bypass the solar panel in heating mode, when the sun is non-existent. i.e. night-time and heavy cloud. Saves huge amounts of energy. Fast ROI with an increased lifespan. COP figures of over 8 are possible on our multi stage compression systems. 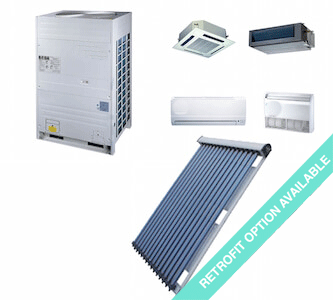 Retrofit systems are available on most types of A/C, Vrf, Chillers and Heat Pumps systems. Works on any size VRF – systems for highest efficiency and easy installation. Also ideal for Split systems and Commercial Refrigeration. Works on any size Air Cooled Chiller – ideal savings and easy installation. Capacity 8 -> 900 kW. Click on the links below to download various types of Projects.